Gaspari Nutrition is a mega-successful company in the competitive sports nutrition and supplement industry. Started in 1998, the company has seen tremendous year-over-year growth and has become a leading brand selling through brick and mortar retailers like GNC, Vitamin Shoppe, and through online retailers like bodybuilding.com and prosource.com. Traditionally, Gaspari’s marketing efforts were focussed on high-gloss, high-cost print ads in sports and fitness publications. These ads, though successful at establishing brand credibility, were difficult to track and therefore hard to establish ROI. In the mid 2000’s Gaspari initiated a number of non-traditional marketing activities which combined guerilla marketing with digital efforts. One major initiative was the development of a fitness roadshow which featured well- known Gaspari endorsed athletes. The program grew to a point where over 40 events were being held each month. With this many local events going on each month, the challenge was efficiently coordinating the marketing efforts around each event. While store managers or gym owners would do their best to put up posters and talk up the event, frequently reps and athletes would be speaking to only a few ‘store traffic” customers. Gaspari needed a better way to promote these events that did not solely depend on the store manager. 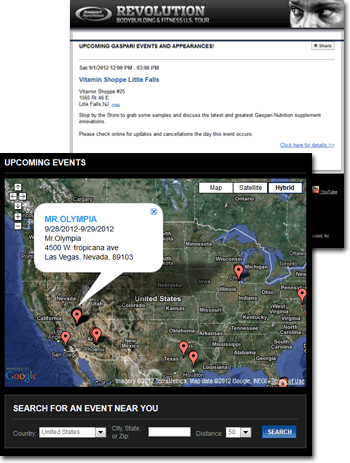 Gaspari turned to Bullseye to look for ways to target promotional emails for these events based on location. Bullseye was already being used to power Gaspari’s online store finder software. Extending the functionality to cross-reference event locations with Gaspari’s growing database of 100,000 members seemed like the way to go. This became the starting point for the development of a Local Event Management System (EMS). Using Bullseye’s Salesforce Integration tools, we established near real-time synchronization between the locations in the EMS and accounts in Salesforce. As events are scheduled, athletes/reps are notified and the event is queued for email marketing. Each week, a batch process works through the email list and uses Bullseye to match members with events based on distance and sends them a high-impact event announcement which includes the rep or athletes name.